G.fast is an exciting new broadband technology that businesses like yours can use to get ultra-fast speeds on average of 300Mbps. In this article, we'll cover what G.fast is, the speed capability, UK rollout plans and lastly how to check availability at your business premises. G.fast is a technology that piggybacks on the extensive UK fibre to the cabinet (FTTC) network. G.fast increases the speed of FTTC by applying much higher frequencies than VDSL2 to achieve faster speed capability over existing copper lines. 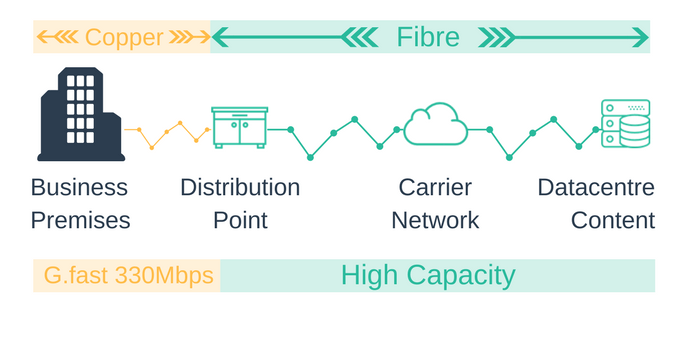 Previous limitations of FTTC are overcome for businesses that are located up to 500m from a distribution point. BT has installed G.fast technology in existing FTTC cabinets enabling businesses within 500m to access the higher speeds. The increment in bandwidth capacity is significant, a current FTTC customer 200m from a cabinet would expect to achieve around 70Mbps of download speed through FTTC. With G.fast this speed will increase to around 300Mbps. 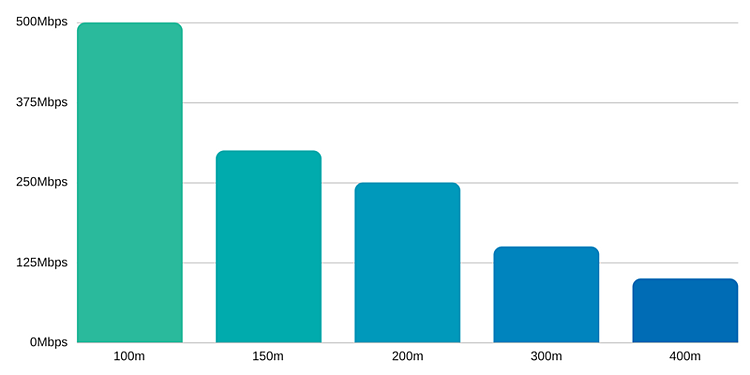 By using higher frequencies, the speed capability of G.fast is vastly superior to that of FTTC. 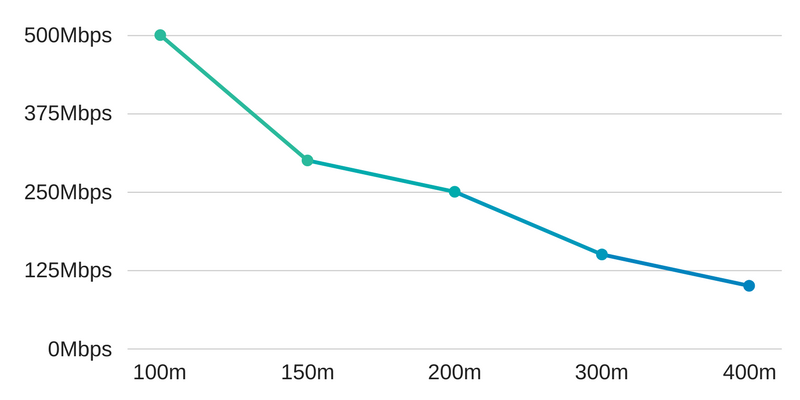 This chart shows the impact of distance from the FTTC cabinet on the anticipated download speeds offered bt G.fast. As you can see the speeds decrease as the distance of the copper line increases. What does the G.fast rollout look like in 2018? In 2014 BT announced a significant investment in G.fast. BT set out it's intent on a major deployment of G.fast technology which would lead to G.fast being available at 10 million UK premises by the end of 2020. The rollout would offer these locations broadband speeds of 300Mbps and above. On August 17th, 2017 BT further announced that their pilot of 330Mbps capable hybrid fibre G.fast broadband technology was significantly expanded to include 26 new locations across the United Kingdom (1 million premises by the end of March 2018). While FTTC's maximum download speeds of around 80 Mbps may be enough for many UK businesses, the same was thought ten years ago when ADSL and ADSL2 were introduced. VoIP, cloud applications such as online CRM, accounting Office 365 and Google Apps, online backup and rich web browsing require significant levels of bandwidth per user. According to the ITU, G.fast "will increase the feasibility of implementing bandwidth-intensive services". G.fast offers significantly faster capabilities and therefore can support bandwidth-intensive usage. G.fast's ability should provide enough bandwidth to help the growing needs of UK businesses for at least the next 5-10 years. Speed is, therefore, the main advantage of getting G.fast in your business. One of the significant disadvantages of FTTC is that the speed capability degrades the further you are from the street cabinet. FTTC is still reliant on copper lines which connect your business with the street level cabinet. The longer the copper line, the lower the speed you will receive over FTTC. Unfortunately, this doesn't change with G.fast. The higher bandwidth capacity is still restricted to businesses that are less than 500m from the street cabinet. The best way to identify if your business could benefit from G.fast is to use a G.fast checker. By entering your existing line number, e.g. 01225 665778 you can check if you can apply G.fast to your broadband service. Amvia's G.fast checker can independently analyse all providers that offer G.fast at your business location and provide you with not just an availability check but also a speed estimate and an unbiased costs estimate from all providers available to you at your business premises.